After graduating from University of Plymouth I started work at the Met Office, where I was employed as an Information System Security Officer, responsible for IT security governance. After eighteen months in this role an opportunity arose to fill a graduate position on the Thales UK graduate development programme. 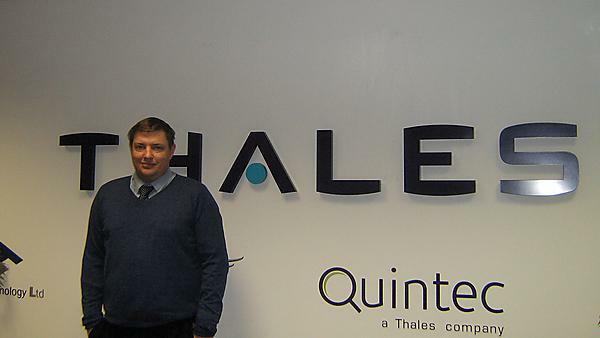 Thales is an international organisation with over 86,000 staff worldwide. They offer opportunities in nearly all facets of computing security and have recently made a large investment of £2 million pounds into a new battle lab to expand their already considerable cyber security capability. I have only been with Thales for a short time and have already been involved in a number of projects that span many business sectors, expanding both my technical ability and my soft skills. I'm able to expand my knowledge in almost any area of cyber security, honing my skills in the areas that interest me. My colleagues and managers at Thales are very interested in the work I completed on visualising network traffic during my final year project and I hope to take this research further during my time working with them. They were particularly impressed with the breadth of knowledge that my degree had equipped me with, which included modules covering mobile, networking and application security. Most importantly, the knowledge I gained is relevant to the work I'll be undertaking both now and in the future. It is great working for a company that treats you like a professional from day one and that values your opinion.